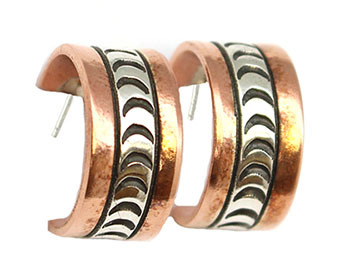 Copper post hoop earring with a strip of stamped sterling silver down the center. It measures approximately 3/8" wide and has a 5/8" hoop diameter. It is Navajo hand made by Wylie Secatero. Stamping will vary. Post and ear backs are sterling sillver.